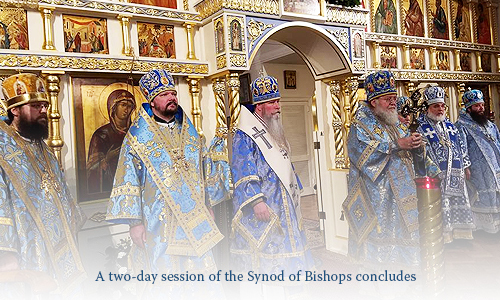 On Friday, December 9, 2016, the feast day of St Innokenty of Irkutsk, the Synod of Bishops of the Russian Orthodox Church Outside of Russia concluded a two-day session in New York City. After Divine Liturgy celebrated by Protopriest Andrei Sommer, Senior Priest of the Synodal Cathedral of Our Lady “of the Sign” in St Sergius Chapel, His Eminence Archbishop Kyril of San Francisco and Western America, Secretary of the Synod of Bishops, presented newly-minted Synodal Znamensky medals in three degrees. Nicholas Ohotin, delegated to work with the real-estate company Colliers International, reported on prospects being researched by the firm on long-term rental possibilities for portions of the Synodal Residence in New York. The Synod reminds its clergymen and flock that the intention is to find a renter, and not a buyer, for certain parts of the building complex. Mr Ohotin also reported on his discussions with representatives of the Russian Federation and the Imperial Orthodox Palestine Society. The Synod of Bishops then heard reports by its Treasurer, Subdeacon George Schatiloff as well as Protodeacon Dionisy Lvov, Manager of St Zosima Church Supply in Mahopac, NY. Mr Shatiloff also made a presentation on the stage-by-stage renovation project of the Synodal Residence. Hearing a brief report by Protopriest Serafim Gan, Chancellor of the Synod of Bishops, on the English translation of the service to St Jonah of Hankow the Miracle-worker prepared by Elizabeth Purdy, the Synod expressed thanks for their work and charged the Synodal Translation Committee to review and edit the draft. This committee is to report on its work to the next session of the Synod of Bishops. The Synod then issued a series of administrative decisions, and approved a draft congratulatory letter to President-elect of the United States Donald Trump, along with other documents. In conclusion of this session, the Synod member hierarchs made a series of intercessions for ecclesiastical awards to clergymen and laity in their respective dioceses for their exemplary service to the Holy Church. Closing the session, His Eminence Metropolitan Hilarion of Eastern America and New York, First Hierarch of the Russian Orthodox Church Outside of Russia, expressed thanks to his brother hierarchs for the love, wisdom and zeal they infused in their work. This entry was posted in News and tagged Colliers International, Mr Ohotin, New York City, Russian Federation, Synodal Residence by Orthodoxy Cognate PAGE. Bookmark the permalink.